In the sleazy, foreboding world of winos, derelicts and drifters in lower Manhattan, two young runaways – eighteen-year-old Fred (MIKE LACKEY) and his younger brother, Kevin (MARK SFERRAZZA), live in a tire hut in the back of a vast auto wrecking yard. Fred is burnt-out by the forces that destroyed his family life, whereas Kevin, having missed much of their childhood trauma, yearns to get back into society and lead a normal life. The most lethal threat to the boys is the case of Tenafly Viper in Ed?s liquor store window. Ed found the cheapo wine behind a wall in his basement. The stuff’s forty years old, and it’s gone real bad. Anyone who drinks it melts within seconds… and it’s only a dollar a bottle!! The bums are lining up for their deaths like moths at a flame, and Fred standing right there amongst them. 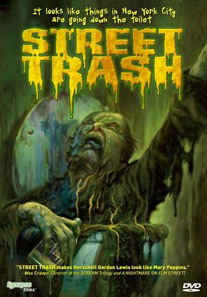 STREET TRASH is the subversive cult classic horror-comedy that rode the last wave of super-gore in the late ’80s before the curtain fell on such outrageous material and we entered an era of safe, “R” rated horror flicks and endless, unoriginal remakes. This release is a movie-only single-disc edition. Synapse Films also sells a 2-DVD Special Meltdown Edition, loaded with other extras.